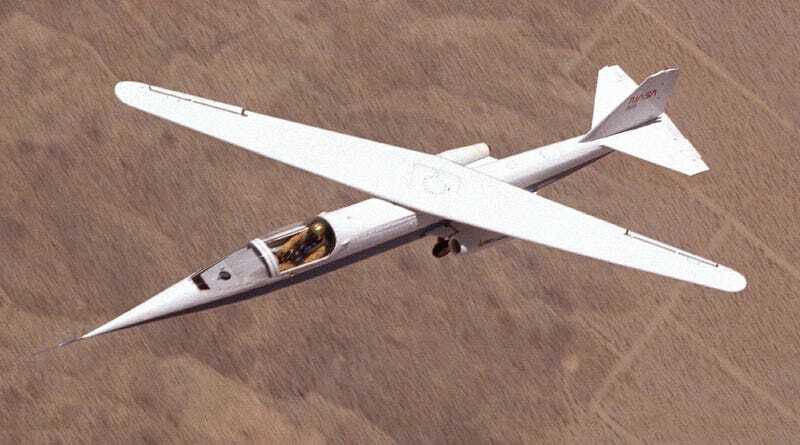 The AD-1 Oblique Wing Research Aircraft was designed and made at NASA's Dryden Flight Research Center—located in Edwards, California, in the western Mojave Desert—in the mid-1970s. Engineers were curious about the aerodynamic characteristics of such a plane, as well as the control laws required to govern it. Their objective? Better fuel economy: Wind tunnels at NASA Ames showed that an oblique wing design will use half the fuel at supersonic speeds, thanks to superior aerodynamic qualities. The AD-1 followed a smaller scale remote-controlled plane, which was developed in the mid-1970s. The manned plane—piloted by NASA Research Pilot Thomas C. McMurtry—took off for the first time in December 21, 1979. It worked. The plane took off on a normal configuration, flying normally at low speeds. As it accelerated, the wing would rotate until it achieved its optimum angle. The apparently crazy aircraft completed its technical objectives, but it suffered from poor handling at sweep angles above 45 degrees, in part because of the materials used in its construction. Sadly, no more research was made and the plane flew for the last time on August 7, 1982.